Wedding creates a special occasion for each of us and therefore fully deserves original solution. Selection of a suitable wedding car is surely a part of it. So, forget todays modern shining limousines and try something else, unique and something unusual which you cannot forget because your wedding day should be the exceptional in every way. And AMSTRONG SIDDELEY Sapphire 346 is exactly what you are looking for. It has noble and aristocratic look with combination of beautiful burgundy and cream color which surely gives the extra atmosphere to your wedding moments. The price for hiring this car, including a driver, is made based on individual request and wishes of a client. 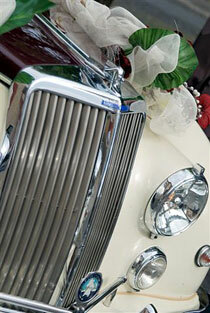 The car comes available with wedding decoration which is included in the price. It will make us happy to give you a price proposal based on your requests. However, we kindly remind you to book the car in advance because this is the only way to guarantee the car is made available for the time you need.